Welcome back to the H. Moradi Jewelers’ blog! Our blog is the place to learn about all things jewelry — both practical and interesting. 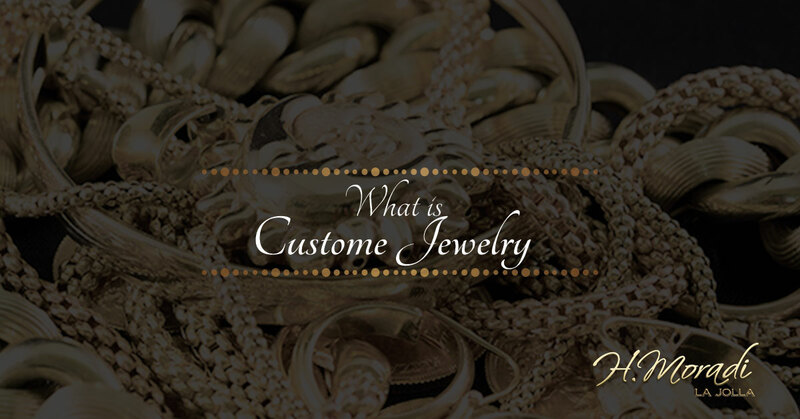 In our last blog post, we discussed some of the steps to take to determine the worth of your jewelry. In another previous post, we talked about Victorian jewelry and propensity of designers to include symbolism in their pieces. Today, we are going to dive back into the books of history to discuss the origins and evolution of costume jewelry. Costume jewelry refers to the early 20th century term “costume” which meant what we would call an “outfit.” This type of jewelry differs from fine jewelry in that costume jewelry is for the sake of completing an outfit; the primary purpose of fine jewelry is as collectables, keepsakes, or monetary investments. Usually, costume jewelry is made with rhinestones, lucite, pewter, silver, nickel, brass, and other non-precious and inexpensive materials. The origins of costume jewelry could be said to go as far back as 300 years ago. However, most would say that the 20th century was the moment in history when the idea of costume jewelry took off. During this golden age of costume jewelry, pieces worn by actress such as Bette Davis, Vivien Leigh, Elizabeth Taylor, and Jane Russell could finally be worn by the everyday woman; copies of such pieces were easy to replicate due to advances in machinery and technology. Heirloom pieces were even replicated. Women of all classes could decorate themselves with fashionable jewelry. During the 1900s, time periods were defined by their style, and the costume jewelry, as was to be expected, mirrored or complimented those styles. The art deco period was cut short with the onslaught of the Great Depression and World War II. The retro period was all about being big and bold. As the art modern period advanced, so did the designs of the time become more influenced by hippie culture. If you shop at any typical mall or modern retailer, you can still find a wide variety of costume jewelry that reflect some of the most popular trends of the modern day, made from materials including non-precious metals, crystals, beads, rhinestones, leather, feathers, wood, and glass. Women have been able to expand their own personal style with jewelry boxes heaping full of jewelry. Ready to Clean Out Your Jewelry Box? Are you ready to breath new life into your jewelry box? It may be time to speak to the jewelry buyers of H. Moradi Jewelers in La Jolla. We offer competitive prices for all types of valuable jewelry as well as luxury watches and engagement rings. Visit our website to learn about selling your jewelry for cash or trading it in for something new or stop into one of our two locations in La Jolla.